First of all can I just get a massive appreciation for keeping my hair dark for 7 months, considering how notorious I am for dying my hair I think I did pretty well to leave it alone for that long. 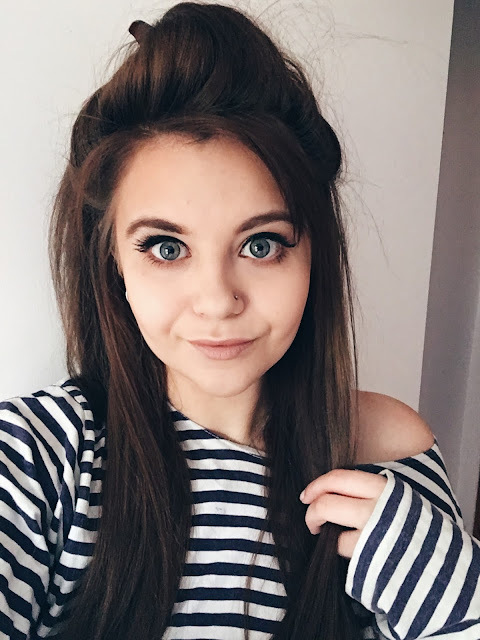 So summer is quickly approaching, and as much as I did like my dark hair I found myself getting bored and I always prefer my hair lighter in the summer. So it was time to bite the bullet and attempt to go back blonde. As I am very much a DIY hair dyer, I knew this was probably going to be one of my most difficult dye jobs to date. *has horrific flashback to the last time I tried to dye my hair from black to blonde. * I went into it this time a little older, wiser and with a few more tricks up my sleeve. What could go wrong, right? It's a pretty difficult task to going from dark brown to blonde without using bleach, so I wanted to try and find one which would be easy to use and wouldn't completely destroy my hair. 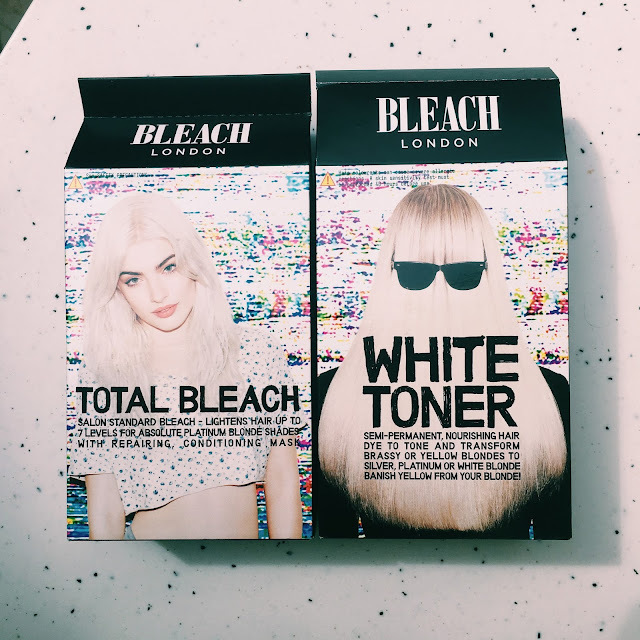 I opted to try one from the brand Bleach London, it's in their name so I thought it wouldn't do me too wrong. It was actually pretty kind to my hair and did a really good job at stripping the colour. I tend to forget when dying my hair that my hair is actually quite long so annoyingly I did run out of bleach, hence why it's a tiny bit patchy. As a lot of bleaches can do, it made parts of my hair go quite yellowy/brassy so I used the Bleach London White Toner to try and diminish those tones as much as possible. It didn't work quite as well as I'd hoped unfortunately, but did enough of a good job that it wasn't ridiculously obvious. I left the hair a couple of days after bleaching to let it rest and restore a little bit before opting to put some Colour Freedom silver blonde all over my hair. (I forgot to take a picture of the packaging before I threw it away, oops. But you can buy it in Superdrug and they have loads of colours.) Silver or Purple shampoos/toners are the best for getting out the yellow/brassy pigments in your hair. Whilst this did help to tone down the brightness it did leave the ends of my hair with a slightly pinky tinge. Which I don't mind too much, it looks quite cool. Since then I've been using purple shampoo/conditioners alternating when I wash my hair just to keep those brassy tones at bay, so hopefully that will gradually help get it to my ideal colour. I'm actually really happy with how it turned out, considering how dark it was before I'm really pleased with the colour. It's not exactly how I wanted but it's a good base to start from, cost a lot less than getting it done professionally and my hair didn't all fall out so that's a massive bonus. I would definitely recommend Bleach London if you are looking to go blonde from dark hair, it works well, is fairly cost effective and has actually left my hair in surprisingly good condition. What's your go to hairdye brand? Are you a DIY-er or a Salon junkie?